Any orders placed will be filled after May 7th, 2019. Our original applique patterns are decorative with lively colors and unusual designs. All the wool is hand-dyed by me one piece at a time. My wool is dyed and stored in my smoke free and pet free home. Other patterns listed are by Threads that Bind. Delightful wool appliqué patterns. Create layers of interest with your favorite embroidery stitches and beading. Wool appliqué kit to make your own needle case! Extremely handy to organize and store your needles for wool appliqué and sewing on buttons. Kit includes color photo, instructions, all wool necessary for project, and a button for the closure. Finished size is approximately 4" x 4", and has six pages inside. Wool Appliqué Pattern. Completed size is 7" x 32". Pattern sold separately. 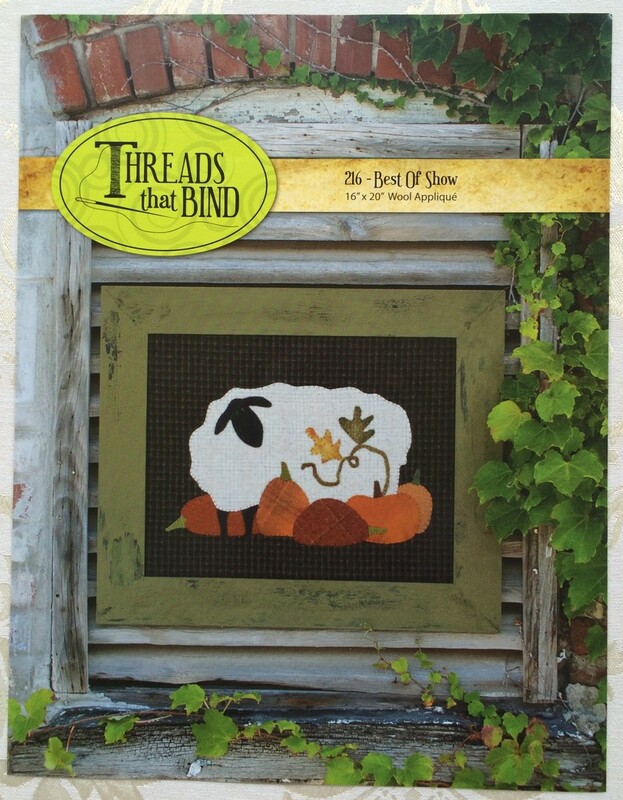 This kit includes all the wool you need to compete this design by Threads That Bind. All the wool is hand-dyed by me. Use your favorite decorative stitches to embellish the stars and stripes! Wool Appliqué pattern. Finished size is 7" x 32". Pattern sold separately. 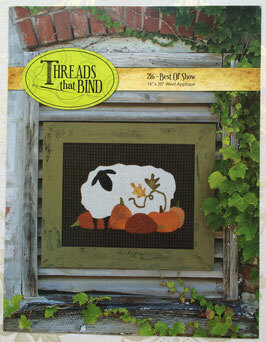 This kit includes all the wool you need to complete this sweet design by Threads That Bind. I choose an alternative color plan. My very own hand-dyed wool for the background, flowers, stems and leaves. Beautiful texture for the flower pot. 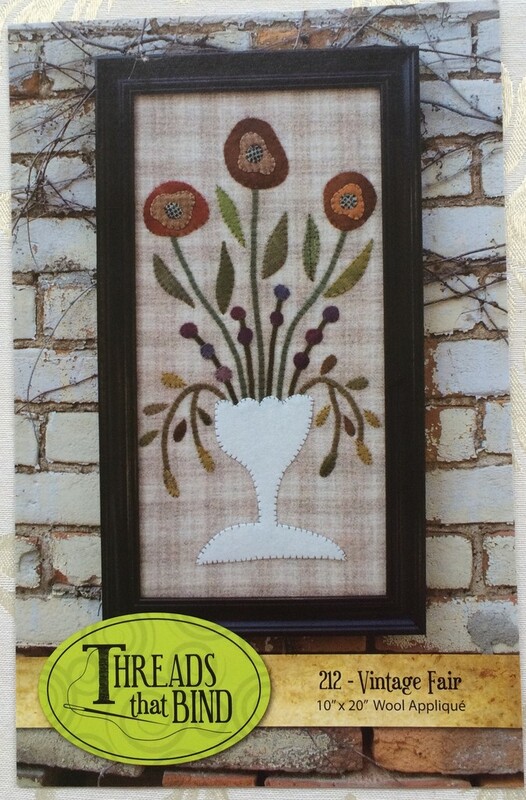 Use your favorite embroidery stitches to embellish the leaves and flowers! Wool Kit for Bountiful Blessings. Pattern sold separately. 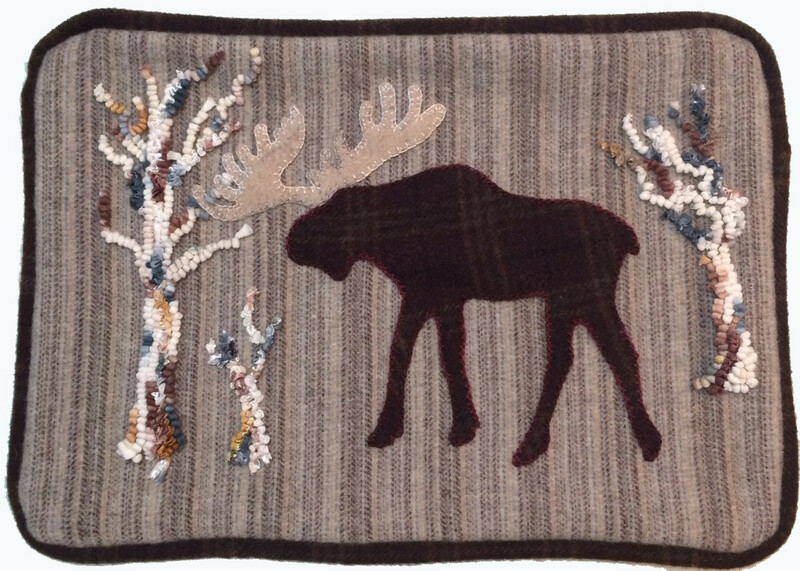 10" x 13.5 " Moose pillow. 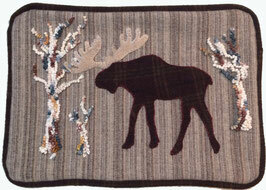 Wool appliqué and rug hooking combined! The birch colored yarn is hooked right through the striped wool - how easy is that! The kit contains the pattern, yarn, and wool to complete the kit. You will enjoy this for your cabin or hunting lodge! Sweet little sheep is Best of Show at the county fair! 16" x 20" finished size can be used as a framed piece, wall hanging, or pillow. Wool appliqué pattern for a wonderful wall hanging, framed or unframed. Finished size is 10" x 20". Lovely table runner for spring or fall depending on the color plan you choose. 11" x 60" will be just the right size for your dining table. Anyone ready for a cool project? Just looking at it makes me cooler during the heat of the summer. Imagine the possibilities with so many noses, hats, scarves, snowflakes and snowballs. This listing is for the pattern only. Each pattern in the package is delightful. I just had to make one, and stuff it and inserted an old bobbin for the stand. For the stem I used a tip from a deer antler. ( my brother collects them ) Be creative, so many possibilities! 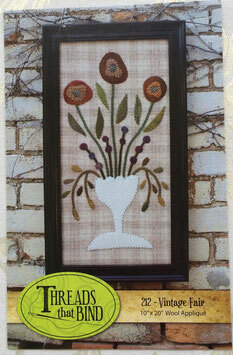 Fun wool applique kit with space to practice new stitches or use your favorites. Finished size is 5.5" x 8.5". Kit includes all hand-dyed wool to complete kit, wool texture for the back, pattern, and stitch guide. Threads and beads are not included. Need a little bag for your sewing tools? Make one using your finished applique piece, or a pincushion, or a seasonal pillow for decoration. "MaryAnn" - a 6 1/2" round pincushion for wool applique is bursting with color! 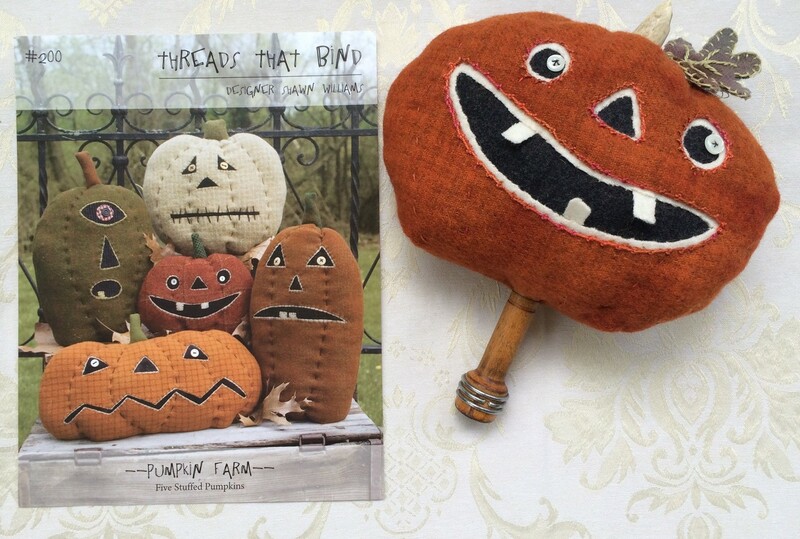 Experiment with your favorite thread, yarns, beads and embroidery stitches. The kit includes the pattern, color photo, instructions, and all the hand-dyed wool to complete the pincushion. You will supply your favorite surface embellishment techniques and fibers, as well as your imagination! Go Wild! Silly purple crow and bug on a giant pumpkin. The kit includes the pattern and all the hand-dyed wool you need to create a pincushion, or add a hanger for a seasonal decoration. Finished size is 5 1/2" square. You just need to supply the surface embellishments. This pattern is designed by Threads That Bind. This finished size is 7" x 32". My hand-dyed wool kit is available. The perfect complete wool kit for the pattern "A Gentle Life"
This is the complete wool kit for the pattern "A Gentle Life". The kit includes hand-dyed wool for the background and textured wool for some of the sheep. The wool in the kit may vary a little from the sample shown in the photo. 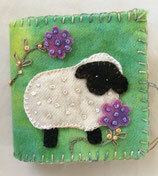 I did make some changes in the middle three sheep and also added some embroidery embellishment for grasses and flowers. The third sheep got a little hungry and I caught him in the act of eating a flower! The pattern is sold separately.